Partially growing up in Puerto Rico, my siblings and I saw a side of entertaining that definitely gave a nod to mother Spain. As I’ve mentioned before in earlier posts, my mother’s family has always been extremely formal as well as intellectually and culturally blessed. Family gatherings were planned with the same attention as any other courtly affair. Aunts, uncles and all cousins were summoned. Men were in coat and tie or, at the very least, their dressiest linen “guayabera”, the favored lightweight shirt worn untucked by legions of Latin men. Women were dressed in silk sheaths, dupioni and peau de soie heels, hair sprayed in place, the still air heavy with their French perfumes. My grandparents house sang with the deep voices of my uncles weaving through the melody of my aunts’ muted murmurs of secrets and town gossip all the while their charm bracelets tinkled faintly and caught light as they raised their cocktails to their ruby-colored lips for a cool sip. Those evenings were always incredibly steamy making it impossible for me to stay looking fresh. Many of those nights I remember sitting in a corner trying desperately to look sophisticated as I dabbed the perspiration running down my face and neck in rivulets. Still too young for contact lenses, my bland and boring cat classes routinely slid down my nose. The only other moisture seen were the water droplets trickling down the sides of the grownups’ cocktails into damp cotton napkins held loosely in their hands. Due to the humidity, Cynthia’s hair took a decidedly unattractive turn as uninvited waves and feral curls sprang wildly to life; MY hair, on the other hand, chose the equally unfortunate opposite end of the beauty spectrum and fell limp and flat, lank and lifeless. Oh, that damned muggy heat. Not a pretty picture. The grownups didn’t care…heck, they didn’t even notice! Unsurprisingly my uncles lit up cigarettes, one off of another, leaning in and drawing in deeply to then blow it all out in a big cloud of smoke. God bless. You couldn’t even breathe. I prayed for a breeze. But did I ever get up, walk out to one of the balconies and pull up my hair? Not a chance. I might miss something. The men drank their rum neat and sipped it. If whiskey, or “whee-kee”, was their chosen nip of the night then maybe, MAYBE, one or two ice cubes would be casually tossed into the glass. My sister and I were given exquisite flutes filled with iced water. We held those glasses as though we were enjoying champagne. Close friends of the family dropped by as did invited neighbors. And our beautiful mama flit about like an exotic butterfly from conversation to conversation. She bloomed in Puerto Rico; she always went back to her island with the faint aura of celebrity. She didn’t just study in the States…she LIVED there. Such an adventurous woman. AND she played tennis! No one ever really ate, except maybe Cynthia and me, but there was always a beautifully laid table well stocked with hors d’oeuvre from the delicate finger sandwich or small chip of cheese topped with a rosy mound of guava paste all the way to garlicky fried cod and culantro fritters alongside platters of cold and creamy tortilla Espanola, cut into bite sized squares, the soft potatoes just melted in your mouth. Late into the night music could be heard as one uncle, or two or three, would softly strum their guitar, their rich baritones melding together perfectly as they played and sang classic Latin songs and madrigals. There was no dancing at these get-togethers, just close friends and family connecting and catching up. At some point Cynthia and I would wander off to bed gradually falling asleep to the enchanting sounds of faint farewells at our grandparent’s heavy front gate. Sheltered and loved there were only sweet dreams that night! 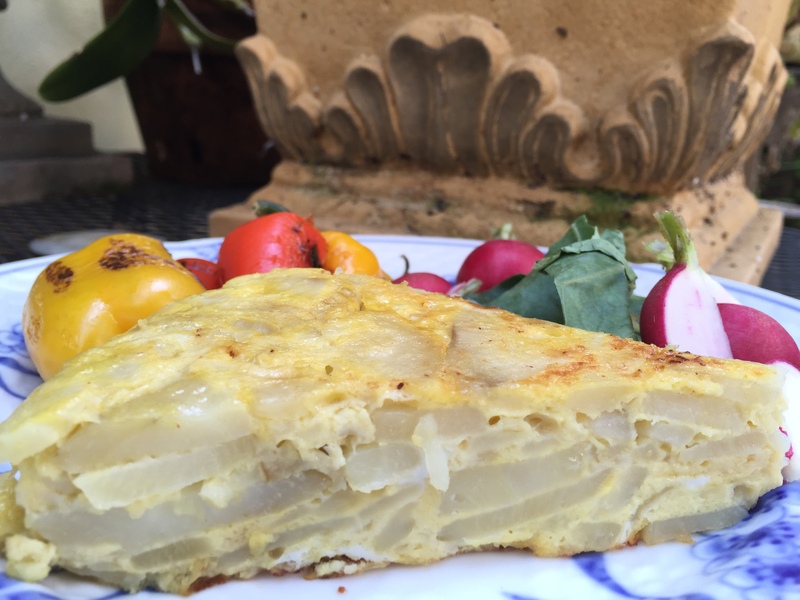 This dish, Tortilla Espanola, is absolutely beautiful. Perfect cut into squares and served with cocktails this torta will also segue easily into brunch as well as a hastily cut slice eaten on the run. 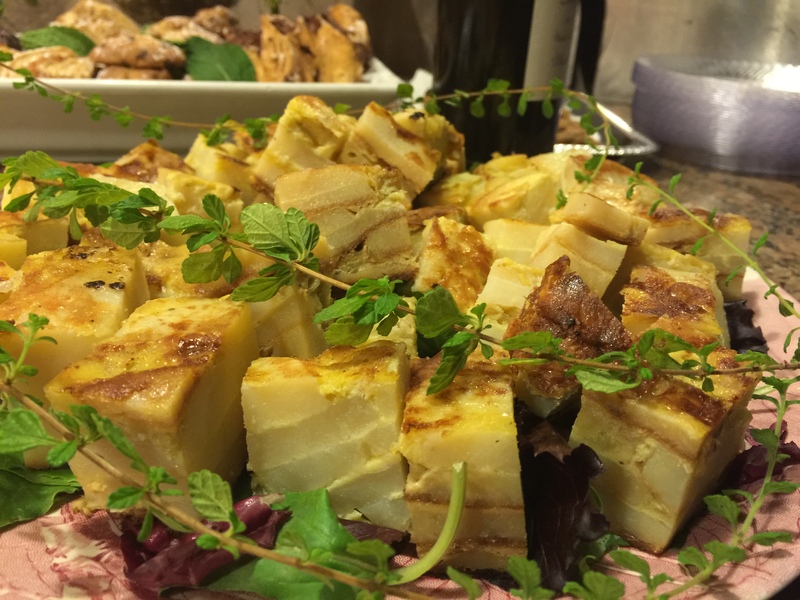 It is the traditional tapas served throughout Spain and other Latin locales. 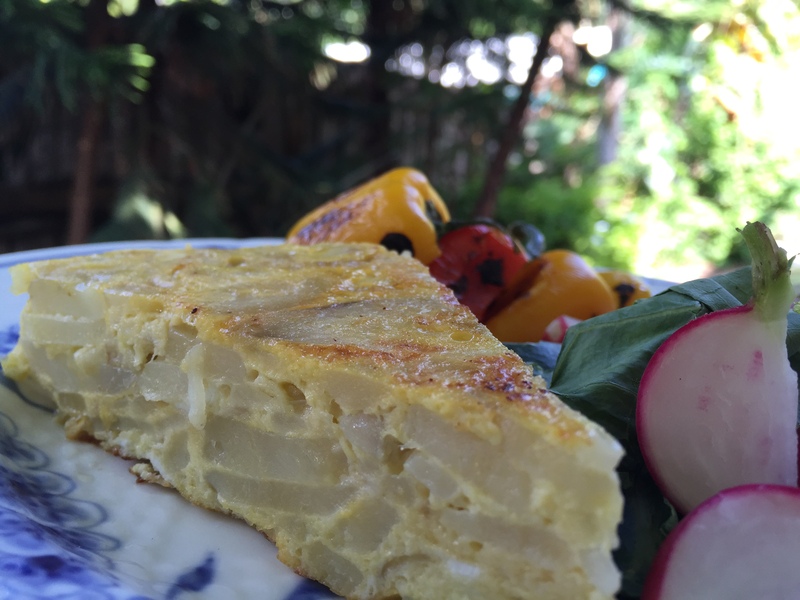 I don’t consider the American equivalent of the tortilla as being an omelette because I find omelettes are more egg than any other ingredient. In a torta the egg is more of a binder. Also the tortilla is cooked slowly rendering the potatoes soft and almost gooey in texture; the onions melt into the mixture but their flavor remains smooth and sweet. 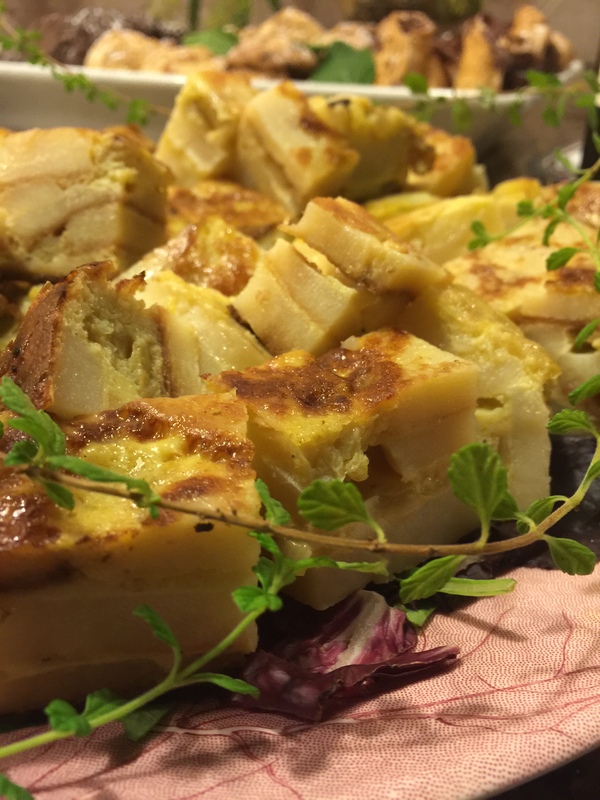 The following recipe is the classic Spanish version of just four ingredients; potatoes, onions, olive oil and eggs. But feel free to add peppers, mushrooms, sausage or herbs. Every recipe is different and individual so there really is no right or wrong way. Please don’t be put off by the “flipping” or inverting procedure of the torta from pan to plate and back. Just use a large, flat platter that feels good in your hand, take your time and invert the tortilla over your sink. Cook the tortilla slowly and resist the temptation to jack up the heat. Medium-low is the ideal temperature throughout the cooking process. If time allows, prepare the dish the day before you plan to serve it to give it sufficient time for the flavors to marry and also to get good and cold. If you decide to prepare this recipe again, strain the olive oil, pour it into a glass jar fitted with a tight lid and store it in the refrigerator. This oil can be used again and again for tortas and the flavor of the oil will make your tortilla taste better and better with each use. Finally, and I can’t stress this enough, definitely use a nonstick pan otherwise your beautiful torta will stick to the pan and fall apart. Buen Provecho! In a 10 inch or 11-inch pan heat the olive oil over medium-low. Add the sliced onion and slowly cook until soft and translucent, about 20 minutes, taking care not to brown them. You don’t want any color. Wipe the potato slices dry with a paper towel and carefully add to the hot olive oil. Cook for 20 minutes or until the potatoes are tender and cooked thoroughly. Place a colander in a large bowl and take the pan of potatoes off the heat. Using a slotted spoon or spider transfer all the potatoes and onions to the colander. Reserve the drained olive oil in the bottom of the bowl for later in the recipe. In a clean glass jar strain the olive oil remaining in the pan for some other time. Refrigerate when completely cool. In a medium to large bowl lightly beat the eggs, season with salt and thoroughly mix in the drained potato-onion mixture. Using the same non-stick pan heat one tablespoon of olive oil that drained from the potatoes over medium-low heat. Pour the potato-egg mixture into the pan and allow to cook without moving the pan or mixture for 4-5 minutes. Gently shake the pan back and forth to loosen the mixture and, using a soft, rubber spatula, pull the edges of the torta away from the sides of the pan tucking the edges under. Cook another 4-5 minutes until the bottom is set. The top of the torta will still be completely uncooked. Give the pan a quick shake, place a large plate or platter on top of the pan and, holding firmly, quickly turn the pan over and invert the torta onto the platter. It feels better if this is done over the sink. At least it gives ME a sense of security! Again wipe the pan clean, add another tablespoon of reserved olive oil and heat the pan over medium-low heat. Holding the plate as close to the pan as you can, gently slide the torta back into the pan. Press the spatula on the sides of the tortilla tucking any edges in and under. You should now have the “top” facing down and cooking and the “bottom” facing up. Cook for another 4-5 minutes, repeat the inverting process of the tortilla, clean the pan, add one tablespoon of olive oil and gently slide back into the pan. Repeat 2 or three times until the tortilla no longer oozes and looks to be set, all pretty and golden. Serve warm in wedges or squares or allow to cool completely, cover with plastic wrap and maintain in the refrigerator until ready to serve. Key Lime Shortbread Cookies with Key Lime Glaze…it’s Daddy’s 93rd!